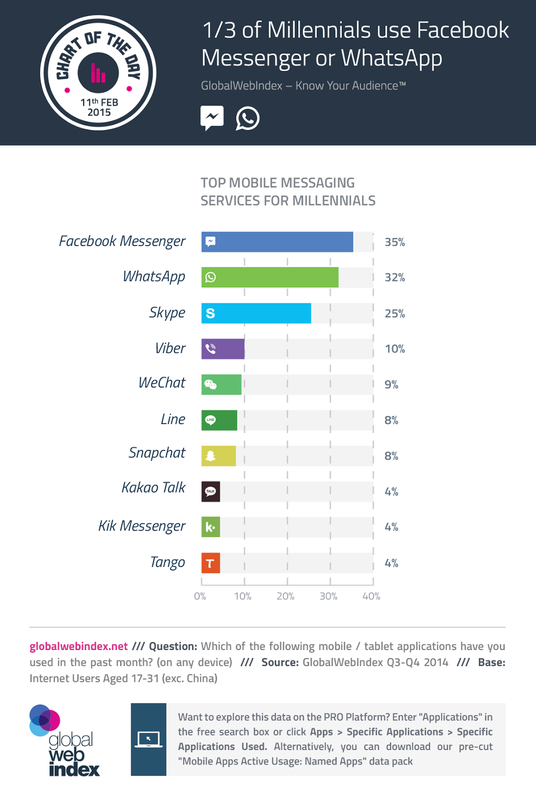 As a smartphone generation, Millennials place a strong premium on the speed of communication offered by messaging apps; as many as 7 in 10 in fact say they use IM services because they are quicker than SMS or social media. Globally, WeChat is the most popular IM service for 17-31s, reflecting its massive success in China (where 60% of Millennials are using it). Outside of China, though, it’s Facebook Messenger (35%) and WhatsApp (32%) which compete for dominance – with Messenger typically doing well in mature markets and WhatsApp posting its best figures in fast-growth countries. Despite hitting the headlines, Snapchat is still a minor force (8%). But this global figure masks major peaks in certain markets: a quarter of Millennials in Ireland are using Snapchat, as are one fifth in the UK and US.